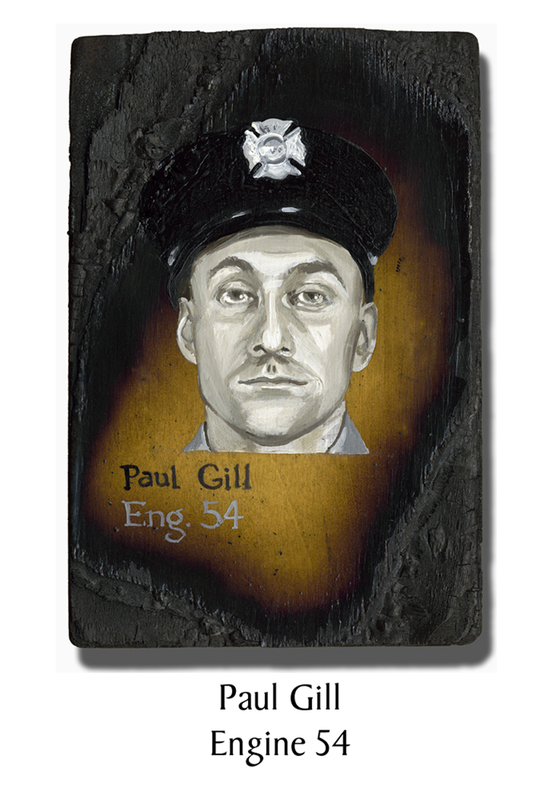 Firefighter Paul Gill, 34, made his first fire rescue before he even became a firefighter. Walking down the street in Queens, he noticed smoke coming from a building and heard a woman screaming for help. He climbed the fire escape and brought both mother and baby to safety before the fire department arrived. He was a carpenter at the time, but this confirmed his true calling and he joined the FDNY in 1999. He continued carpentry jobs on the side to help cover the steep medical expenses of his two sons, one of whom had required a kidney transplant. This entry was posted in Better Angels Stories and tagged 343, 9/11, better angels, Dawn Siebel, Engine Co. 54, FDNY, firefighter, firefighters, firefighters of 9/11, LODD, Manhattan, memorial, NFFF, paintings, Paul Gill, portraits, World Trade Center, WTC. Bookmark the permalink.